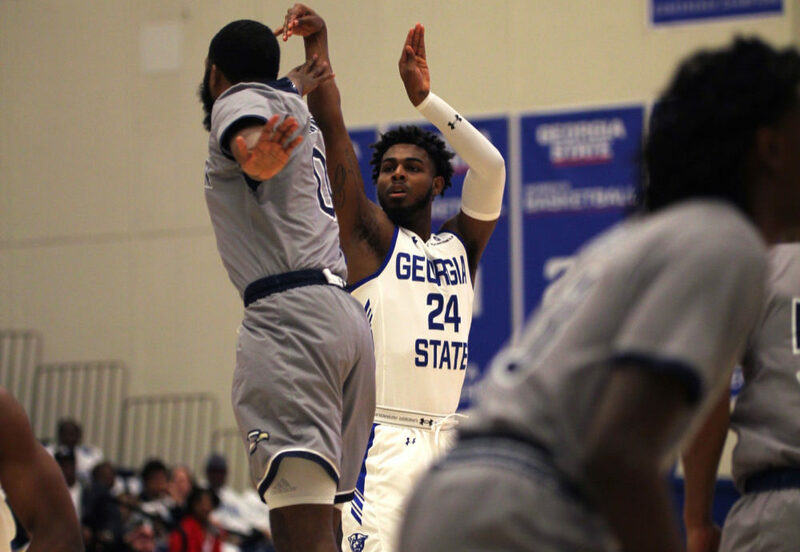 In front of a sold-out crowd, the Georgia State Panthers got back to business in a dominant showing against in-state rival Georgia Southern, winning 81-72. They’re now in sole possession of first place in the Sun Belt Conference. Georgia State looked to gain an edge against the Eagles and reclaim their spot atop the Sun Belt. In recent weeks, Georgia State had relinquished control of the conference as they fell into a “state of complacency,” as head coach Ron Hunter put it. After the team’s blowout loss to Texas State, Hunter alluded to his feelings that his team had become a victim of their recent success. “We played like we’re supposed to be here,” Hunter said after the game. As the Panthers look forward to their final month of play before the NCAA Tournament, setting the tone for the rest of the year with a solid win against a conference opponent was paramount. All eyes were on Simonds and how he would respond to his recent slump, which dates back to his underwhelming performance in a loss to Texas State. Simonds, in the next game against UT Arlington, sat out the entire second half — a game the Panthers went on to win. Against Georgia Southern, Simonds was aggressive early, and it seemed his teammates were looking to get him there as the ball found him in back-to-back possessions to start the game. Simonds, who played the entire 20 minutes of the first half, scored an efficient 15 points on 6-of-10 shooting and brought energy on the defensive end. The Panthers started the game with a clear defensive mindset which helped set the tone for the first half of the game. Georgia State’s defensive agenda Saturday night was to keep Tookie Brown and Georgia Southern’s offense from getting easy looks. Georgia Southern averages 84 points on offense per game, leading the Sun Belt Conference and 16th in the nation. The conference’s most efficient offense, in terms of field goal percentage, shot only 37 percent from the field and missed 10 threes in the first half against Georgia State. The Panthers forced the Eagles into difficult shots for much of the first half and made them uncomfortable executing on that end. The Panthers turned six Georgia Southern turnovers into seven points in the first half. Georgia State closed out to shooters and crowded the paint to keep the Eagles from penetrating – holding them to only 14 points in the paint in the first frame. Georgia State’s defense fueled their offense as they led by as many as ten points in the first half. “We knew they couldn’t shoot the [three] ball that well so we packed the paint and let [Tookie Brown] do what he did,” senior Jeff Thomas said after the game. Georgia State held Brown, who averages 16.8 points per game on the season, to 11 points on nine shots in the game. “Tookie really didn’t have a good game tonight, but we just played hard on defense that’s all it was,” said Thomas. The game would turn in the second half, however, as the Georgia Southern offense adjusted to Georgia State’s pressure on defense, and worked itself into a groove. Behind the offense of Quan Jackson – who scored 16 points in the half. Georgia Southern would score 41 points in the second half on 55.2 percent from the field. Neither team was able to completely hold the momentum with the lead changing 12 times in the second half. Each team made big plays as the game carried into crunch time. Georgia Southern gained its first lead of the second half at 15:10 on a 3-pointer from Jackson. One minute later, Simonds would get the lead back with an explosive dunk off an assist by Thomas. The start of the half was marked by Simonds’ energy and effort on both ends, shooting 50 percent from three, scoring 14 points and adding a block. Down the stretch of the game, Georgia Southern’s defense keyed in on Simonds continued to break down the Panthers’ defense. Georgia State relied on its home court advantage and the poised play of Williams as the score was tight. During shoot-around, Williams, who came off a stellar second half against Texas-Arlington, was particularly enthusiastic minutes before tip. Williams continued his stretch of solid second half basketball as he commanded the offense, scoring 13 points. The sophomore’s defense in a close game stood out as well as he disrupted the Eagles’ offense in key moments with three steals. With the game on the line, Williams attacked the basket and forced the defense to collapse and put him to the free-throw line. Williams made all 6 of his free throws, including four straight in the final minute of the game, putting the game out of reach for the Eagles. With a sold-out home arena of 3,854, while facing their bitter rival, the Panthers capitalized on the chance to regain the conference’s top slot.